Contact Chris Beck, Director of Golf Sales | (843) 842-1488 | cbeck@seapines.com WIN THE TRIP OF A LIFETIME enter today at seapines.com/carolinas HILTON HEAD ISLAND, SC GROUP GOLF PACKAGE INCLUDES: • Three rounds on Harbour Town Golf Links, Heron Point by Pete Dye and NGCOA's National Course of the Year Award winner, Atlantic Dunes by Davis Love III • Three nights deluxe villa accommodations • Complimentary gift card • Group organizer plays free! 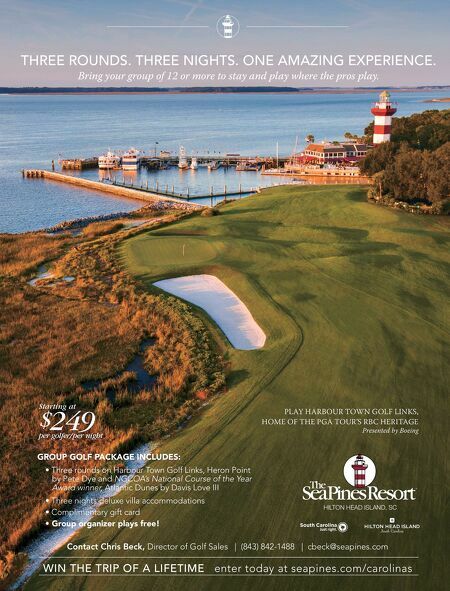 Starting at $ 249 per golfer/per night PLAY HARBOUR TOWN GOLF LINKS, HOME OF THE PGA TOUR'S RBC HERITAGE Presented by Boeing THREE ROUNDS. THREE NIGHTS. ONE AMAZING EXPERIENCE. Bring your group of 12 or more to stay and play where the pros play.